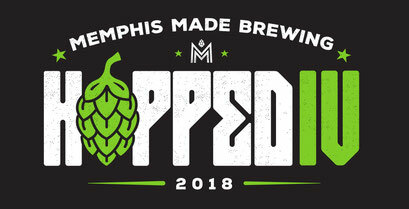 Hopped returns to the brewery this year on Saturday, April 21 and it's looking to be our best one yet. This free festival is in its fourth year and, starting at noon, we'll have a ton of hoppy brews throughout the day. We'll have old favorites like Bear Cat IPA and new beers such as Snap, Crackle, Hopped Breakfast IPA. We're also tapping up several one-off beers every hour at a bar manned by our brewers so that you can learn all about the wonderful world of hops. Live music curated by Goner Records will start at 3 p.m. with performances by Amy LaVere and Will Sexton, Hash Redactor, and River City Tanlines. Will Loden of the Comma Comedians will keep it going between sets. We're give away 16 ounce Hopped IV mugs to the first 100 customers, so get there early. Sushi Jimmi, Smoke & Rolls, and MemPops will be parked at our place to make sure you don't go hungry.